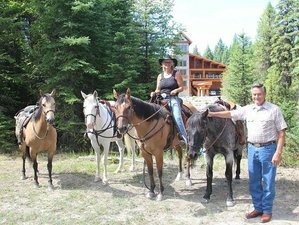 Earl Ancker the owner of EDA Ranch and Lodging and partner Vickie Marks invite you to join an unbelievable horseback riding vacation. Staying at EDA Ranch gives you the opportunity to enjoy the crisp clean air every morning without any interruptions. No matter what your day will be like, they guarantee that you’ll be intrigued by the amazing landscape of Montana. They will treat you with the most respect and provide you with the hospitality services you can’t ever imagine! EDA Ranch treats you to a luxury getaway in a wilderness setting. Hike the trails, bike ride, horseback ride, work out in the equipped weight room or just relax around the ponds and take in the wilderness settings and mountain views. During this getaway, you will be accommodated in the beautiful EDA Ranch and Lodge. You will have an option to stay in the Honeymoon Cabin or in the Honeymoon Suite for a romantic getaway or in the Family Cabin for family or friends getaway. All cabins and suites have kitchenettes and gas grills. Lodge Honeymoon Suite is the most romantic setting that you would ever find. It has a pond-side view with mountains in the surrounding that will take your breath away. It is cozy, private, complete with everything you will need to stay a night or the week. The lodge is equipped with 42 inches HDTV, a private deck with your own BBQ grill, king size log bed, kitchenette with dishes, microwave, coffee maker, and refrigerator. It also has an electric fireplace for a little romance and a jacuzzi tub for relaxation and wireless internet. The Honeymoon Cabin is very intimate with a king size round bed and a jacuzzi / shower tub for two. This is the ideal setting for a very romantic getaway that you will never forget. It has an equipped kitchenette that includes dishes, coffee maker, microwave, and refrigerator. It also has inside a wood stove, firewood, DIRECTV, electric heat, and air conditioning. It is only a few steps to see a beautiful pond that has a covered patio with a gas grill and a small outdoor kitchen. Note: If the internet doesn’t work due to surrounding trees, please feel free to come to the lodge on the first floor. There is a meeting room available. This Family Cabin features two queen size beds, equipped kitchenette with dishes, microwave, coffee maker, refrigerator, inside wood stove with firewood, electric heat, air conditioning, and DIRECTV. It is only a few steps to see a beautiful pond that has a covered patio with a gas grill and a small outdoor kitchen. Vickie Marks is a wrangler EDA Ranch & Lodging. Located in Montana, USA, The cabins are surrounded by the most breath-taking views you will ever see. Each morning, you can enjoy the crisp clean air and sights without any interruptions. No matter what your day will be like, it is guaranteed that you’ll be intrigued by the amazing landscape of Montana that surrounds you. Eureka also provides a variety of good restaurants and two local grocery stores. During this holiday, you will not get meals. However, there are kitchenettes for guests to cook in. Head south from Eureka, Montana. On Highway 93 (about four miles) turn left (east) to Glen Lake Road. Go about four miles staying on Glen Lake Road. After passing a sign called Stonegate (on the right), EDA Ranch is the second driveway on the right. Follow the driveway to the office. Head north from Kalispell and Whitefish on Highway 93. Go about 45 miles and you will see a road sign "Eureka five miles". After that road sign, turn right to Whitetail Lane, go to the stop sign, and turn right (east) to Glen Lake Road. You will not see a road sign confirming that you are on Glen Lake Road. Go for four miles staying on Glen Lake Road. After passing a sign called Stonegate (on the right), EDA Ranch is the second driveway on the right (the entrance says EDA Ranch). Follow the driveway to the office for check-in. EDA Ranch in Eureka, Montana, treats you to a luxury getaway in a wilderness setting offering hiking, bike riding, horseback riding, and more.